Keynsham survived a stern examination from Chichester to continue their Women’s FA cup journey as Chichester. The game was played at Sidlesham with the pitch at Oaklands Park being unfit and finished 2-1 to the visitors. Chichester weren’t at their best and despite a late surge saw their hopes dashed on the threshold of the first round proper. Chichester had the visitors on the back foot early. Cherelle Khassal looked sharp on her return to the starting line-up and Molly Clark, along with Becky Barron, look assured in midfield. Khassal tested the Keynsham keeper in the first minute from long distance and the shot needed strong fingertips from Colette Bell to tip it over the bar. Lauren Cheshire was next to try her luck but keeper Bell was well-placed to make a comfortable save. Keynsham put bodies behind the ball and aimed to counter at any opportunity and this tactic seemed to work as Chichester were frustrated by a well-drilled back line and the tireless work of others. On the quarter-hour, Keynsham hit Chichester with a sucker-punch when one of their counter-attacks produced the opening goal against the run of play. Having just cleared off their own line, the visitors broke with speed. Ceoana Alves drove down the right and put in a perfect cross for Justine Werton-Radburn to rise highest to head in powerfully at the back post. Chichester needed to come back strong and they did. Khassal hit the bar, then, just after the half-hour, hit the woodwork again with a sweet volley from a cross by Chloe Dowdell. Into the second half, Chichester continued to press. Jess Lewry and Molly Clarke were instrumental and each went close to grabbing an equaliser, but Bell was having a top game for the visitors and continued to keep the green juggernaut at bay. Khassal saw an effort cleared off the line. Keynsham thought they had doubled their lead through Alves only to see Cheshire clear off the line. Jade Widdows came on to add a new dimension to the hosts’ play and caused problems down the right, creating several good openings. With Chloe Parkes sent on to offer an added threat up front, and Chichester throwing more and more at the visitors, Keynsham broke again to double their advantage. Pace and skill saw Cristina Vega get clear and fire an effort sweetly into the Chichester net. 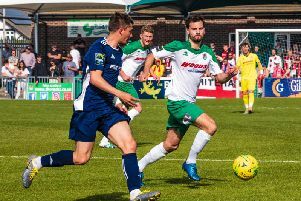 Chichester threw everything at the visitors and Lewry gave the crowd cause to celebrate by grabbing a late goal to leave the game on a knife-edge. But sadly, despite several more excellent chances, time ran out and Chichester were left frustrated. It’s back to league duties this week. CCLFC: Thompson, Cheshire, Challen, Barron, Clark, Lewry, Khassal, Alexandre, Ingram, Dowdell, Wilson-Blakey. Subs: Price, Widdows, Parkes. * City’s development squad and youth teams all had their games called off.